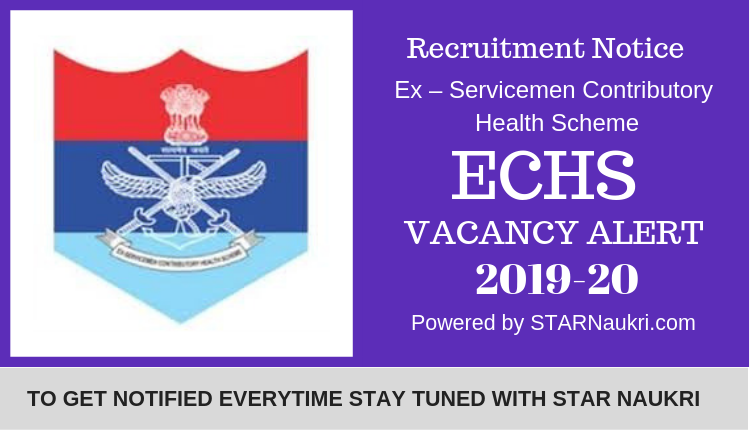 Ex-Servicemen Contributory Health Scheme (ECHS) published recruitment notice on their official website. There are 21 vacancies for the posts of Medical officer, Medical Specialist, Dental Officer, Gynecologist, Officer in Charge, Physiotherapist, Pharmacist, and so on. The details eligibility and application process are given & mentioned below. एक्स-सर्व्हिसमॅन कंट्रीब्युटरी हेल्थ स्कीम (ईसीएचएस) ने त्यांच्या अधिकृत वेबसाइटवर भर्ती नोटिस प्रकाशित केले. ईसीएचएस पॉलिक्लिनिक्स, सेवा वैद्यकीय सुविधा आणि देशभरात पसरलेल्या सिव्हील इम्पॅनल्ड / सरकारी हॉस्पिटलच्या नेटवर्कद्वारे माजी सैनिक पेंशनधारक आणि त्यांचे आश्रित व्यक्तींना सर्वोपचारिक औषधोपचार प्रदान करण्याचा हेतू आहे. वैद्यकीय अधिकारी, वैद्यकीय तज्ज्ञ, दंत अधिकारी, स्त्री रोग विशेषज्ञ, प्रभारी अधिकारी, फिजिओथेरेपिस्ट, फार्मासिस्ट, नर्सिंग सहाय्यक, डेंटल हायजीनिस्ट, चालक, डेटा एंट्री ऑपरेटर आणि क्लर्क यांच्या पदांसाठी 21 रिक्तियां आहेत. तपशील पात्रता आणि अर्जाची प्रक्रिया खाली दिली आहे आणि खाली नमूद केली आहे. Ex-Servicemen Contributory Health Scheme (ECHS) published recruitment notice on their official website(www.echs.gov.in). The Scheme aims to provide allopathic medicare to Ex-servicemen pensioner and their dependents through a network of ECHS Polyclinics, Service medical facilities and civil impaneled/Govt hospitals spread across the country. There are 21 vacancies for the posts of Medical officer, Medical Specialist, Dental Officer, Gynecologist, Officer in Charge, Physiotherapist, Pharmacist, Nursing Assistant, Dental Hygienist, Driver, Data Entry Operator & Clerk. The details eligibility and application process are given & mentioned below.